Like many other fortunate Jumbos, the No. 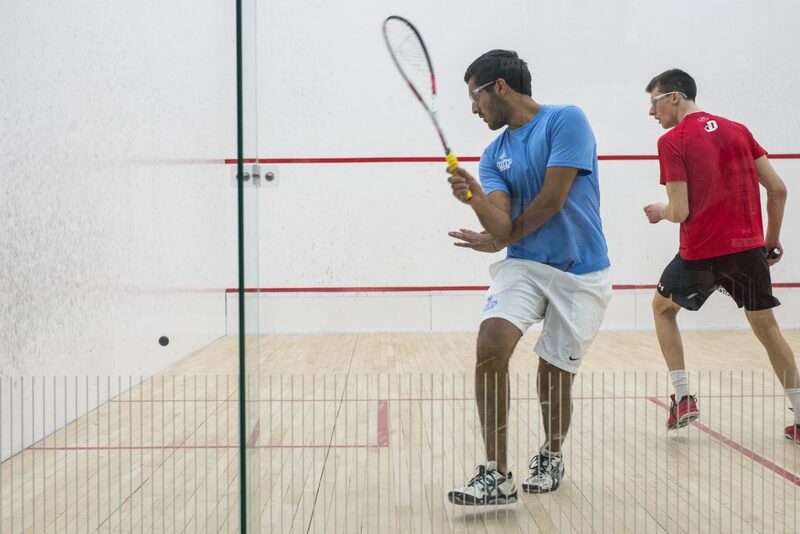 28 Tufts men’s squash team escaped the frigid temperatures of Massachusetts during winter break, traveling to Palo Alto, Calif. for a training trip at Stanford University. By going 3–3 in January play so far, the squad has jumped to 6–5 overall, positioning itself nicely for a late-season push to be ranked among the top 25 teams in the nation. On Jan. 10, in its very first match on the West Coast, Tufts faced an impressive Hobart team stacked with talent at the front of its lineup. As a result, the Jumbos fell in the first five positions, but defeated their opponents in the last four matches of the ladder for a narrow 5–4 loss. Despite the team’s hard-fought loss, reminiscent of its heartbreaking 5–4 defeat to Hamilton earlier in the season, Tufts came back the next day ready to set things right. In November, the men countered the Hamilton loss with back-to-back resounding 9–0 victories against Bard and Boston College. This time around, the Jumbos responded to their disappointing loss with an 8–1 victory over the Stanford Cardinal. Fired up by co-captains Raskopf and junior Aidan Porges, sophomore Raghav Kumar — playing in the first position — lost the first set of his match before bouncing back to win in five. At the No. 2 and No. 3 spots on the ladder, juniors Alan Litman and Raskopf defeated their opponents in four sets. The rest of the squad won in three straight, with the exception of junior Cameron Ewan, who was ultimately outlasted in five close sets: 7–11, 11–8, 11–9, 7–11, 8–11. After finishing a unifying and successful training trip and returning to the cold New England temperatures, the men faced off against No. 17 Dickinson on Jan. 15. The Jumbos eventually fell, 7–2, to the host Red Devils, but not without putting up a fight in several spots on the ladder. “Dickinson has gotten much better in the last few years, but … our No. 2 [Litman] played probably one of his best matches all season, and [first-year No. 8] Danny Hutt played awesome to win in five,” Raho said. Litman took care of business against junior Hal Holappa of Dickinson without letting a tough second set throw him off, eventually winning 11–4, 2–11, 11–9, 11–7. Hutt then defeated junior Vincent Warzecha 5–11, 12–10, 11–9, 7–11, 11–9. In what has become their style, the Jumbos refused to allow one loss become two in a row, defeating both No. 31 Haverford and No. 29 Conn. College by wide, 7–2 margins on Jan. 16. On Saturday, Tufts faced No. 12 Western Ontario, one of the most talented teams on its schedule. Though the Jumbos fell 9–0, the most competitive matches were at the second, eighth and ninth spots, according to Raho. With just three matches remaining before the NESCAC Championships, Tufts is set to face off against NESCAC rivals Bates, Bowdoin and Colby. The squad begins its series of NESCAC competition on Friday at Bates.